Jayam Ravi’s Tik Tik Tik finally hit the big screens today. The movie has a lot riding on it, thanks to the fact that this is the first space thriller from south India. Let us see whether this path-breaking attempt impresses the audience or not. An unidentified asteroid hits earth’s surface and causes panic in the city of Vizag. The Indian Air Force comes to know that another asteroid, which is much bigger in size is on course to hit the earth and wipe out a few states in South India. Seeing this, the Indian army employs Vasu(Jayam Ravi) and his gang to carry out a mission to deteriorate the asteroid and save planet earth. Why did the army choose Vasu to carry out the mission? Will his crew be successful in completing the larger-than-life task? What are the hurdles they face? Catch the movie in theaters to know the answers. As the trailer suggested, the movie has good action episodes which are high on graphic content. The outside view of the spaceship has been designed well and the CGI works look neat. This movie boasts of having some of the finest visual effects in recent times. Jayam Ravi is good as his mature performance is an added bonus to the film. He looks settled in his role and tried the best to get into the skin of his character. Nivetha Pethuraj looks fine as a lady officer in the Indian army and carried out her role with ease. The remaining supporting cast did their job well. The father-son bonding in the movie plays a crucial role and has come out really well. Jayam Ravi’s son, Aarav is seen in this role and he creates a good impact while he is on screen. The director tried to make this movie an interesting thriller, by bringing in a few subplots that run on the rivalry between India and our neighboring nation. These episodes look a bit unconvincing as the conflict point is weak and fails to create the desired level of impact. The original plot is revealed only towards the pre-interval block and the character establishment sequences have been dragged a bit long. A few comedy sequences in the first half may damage the feel as the audience who expect a gripping space thriller, are served a different dish in the initial stages. A key action episode in the second half has come out in a bad way. Unnecessary drama and lackluster emotions take center stage and irritate the viewers. Many people may feel distracted during this sequence. The director, Shakti Soundar Rajan made a daring attempt and succeeded to an extent. His technical expertise and understanding on contemporary space thrillers are clearly visible. However, he takes references from Hollywood biggies like Now You See Me 2 and Interstellar. The viewers who watched these movies can easily connect the dots. Music by D.Imman is fine and the title song can stay on the top of music charts for a while. With that being said, space thrillers need an intensive and engaging soundtrack that brings an authentic vibe to the proceedings. Had the music department opted for an immersive sound experience, the entire output would have been elevated to a new level. Camera works are neat for most parts but things go haywire in a key episode in the second half. 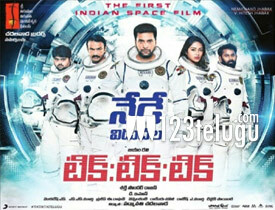 On a whole, Tik Tik Tik is a new age space thriller which provides a different experience to the viewers. Good graphics, interesting setup, and strong performances are major advantages. However, the movie has its own share of flaws and that may obstruct the flow for a section of the audience who are not used to such subjects. If you are a big fan of space thrillers, give this movie a try and witness the first-of-a-kind attempt in Indian cinema which ends up as a decent watch this weekend.